As patient lift technologies continue to improve, great strides have been made in fixed, semi-fixed and portable systems designed to lift and/or transfer immobile patients. 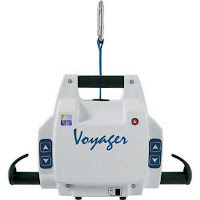 What you'll find with the new Voyager® 98000 Portable Overhead Lifter is the industry's lightest lifter, weighing in at just 12 pounds, including the battery. And yet, even though its weight is modest, its lifting capacity is anything but, with a lift limit set at a whopping 440 pounds! The 98000 is made exclusively for use with the Voyager Easytrack® Patient Handling System. With a combination of the Voyager Overhead Lifter and the Easytrack System, patient transfer has improved by leaps and bounds. This is an overhead lift system that works where other portable lifts won't due to furniture, thick carpeting or tight, confined spaces. The system can generally be set up in a room in as few as five minutes by a single person, and without the use of any tools. It's just as convenient to transfer the system from one room to another within a home. There's never been a better time to buy a Voyager 98000. You'll see that they're currently discounted at about 25%. Easytrack components must be bought separately, but for simple transfers from bed or bath into a chair, a single-track unit will suffice. Optional second, third and fourth track setups are available, and many configurations can be chosen to fit the exact needs of the patient who will be serviced by the unit. Soft start and stop, allowing patients to be lifted and lowered with minimal jerking motions. This lift is capable of picking someone up even when they're on the floor. It lifts a patient as high as 48" from the ground. Dual controls with a removable handset allow for max flexibility. A unique release strap lets the unit be moved from one rail to another instantly, saving time and trouble. A low battery is indicated by an audible alarm. The battery is rechargeable and removable, allowing the lifter to be in continuous use even while the battery is recharging. Automatic stop and lower in the event of an emergency. Those currently using this ceiling track lift rate it very highly. It's a great lifting and transfer solution that deserves serious consideration.